Johann Fust (or Faust) published the oldest known exactly dated printed book, the Mainz Psalter, a folio of 350 pages (circa 3 years after Gutenberg's invention of the printing press). The Cape Girardeau meteorite, a 2.3 kg chondrite-type meteorite, struck the ground near the town of Cape Girardeau in Cape Girardeau County, Missouri. C. H. F. Peters discovered asteroid #111 Ate. D. Stewart discovered asteroid #475 Ocllo. Gustave Whitehead flew his Number 21 airplane three times in the first claimed powered flight. The longest flight was 2.5 km (1.5 miles) at a height of up to 60 m (200 ft), significantly better than the Wright brothers 2 years, 4 months later. Gustave Albin Whitehead (1 January 1874 - 10 October 1927) was a German-American aviation pioneer. His first published flight took place on 14 August 1901 in Connecticut when he flew his Number 21 three times, as reported by the Bridgeport Herald, the New York Herald and the Boston Transcript. The longest flight was 2.5 km (1.5 miles) at a height of up to 60 m (200 ft), significantly better than the Wright brothers' initial flights two years and four months later. There are witness reports that he flew about 1 km (half a mile) as early as 1899. In January 1902 he flew 10 km (7 miles) over the Long Island strait in the improved Number 22. It has been suggested the reason his flights are so little known is he was of German origin, and that the Wright brothers donated their Wright flyer to the Smithsonian Institution on condition the museum did not recognize an earlier airplane. Korolev's OKB-1 was made a design bureau independent of NII-88 in the USSR. NASA and the USAF launched X-15A Const Theta Entry Test mission # 67 in which Joe Walker reached a maximum speed of 6030 kph (Mach 5.25) and a maximum altitude of 59.009 km, with a new reentry technique using pitch angle instrument instead of AOA. NASA and the USAF launched X-15A-2 Stability Test mission # 114 in which Robert Rushworth achieved a maximum speed of 5778 kph (Mach 5.23) and a maximum altitude of 31.486 km. The nose landing gear extended at Mach 4.5, both tires blew on landing. NASA's Lunar Orbiter 1 was injected into Lunar orbit and became the first US spacecraft to orbit the Moon. NASA's Lunar Orbiter 1 spacecraft, launched 10 August 1966, was designed primarily to photograph smooth areas of the Lunar surface for selection and verification of safe landing sites for the Surveyor and Apollo missions. It was also equipped to collect selenodetic, radiation intensity, and micrometeoroid impact data. The spacecraft was placed in an Earth parking orbit on 10 August 1966 at 19:31 UT and injected into a cislunar trajectory at 20:04 UT. The spacecraft experienced a temporary failure of the Canopus star tracker (probably due to stray sunlight) and overheating during its cruise to the Moon. The star tracker problem was resolved by navigating using the Moon as a reference, and the overheating was abated by orienting the spacecraft 36 degrees off-Sun to lower the temperature. Lunar Orbiter 1 was injected into an elliptical near-equatorial Lunar orbit on 14 August, 92.1 hours after launch. The initial orbit was 189.1 km x 1866.8 km, had a period of 3 hours 37 minutes and an inclination of 12.2 degrees. On 21 August, perilune was dropped to 58 km, and on 25 August to 40.5 km. The spacecraft acquired photographic data from 18-29 August 1966, and readout occurred through 14 September 1966. A total of 42 high resolution and 187 medium resolution frames were taken and transmitted to Earth, covering over 5 million square km of the Moon's surface, accomplishing about 75% of the intended mission, although a number of the earlier high-res photos showed severe smearing. It also took the first two pictures of the Earth ever from the distance of the Moon, the first being taken on 23 August 1966. Accurate data were acquired from all other experiments throughout the mission. Orbit tracking showed a slight "pear-shape" to the Moon based on the gravity field, and no micrometeorite impacts were detected. The spacecraft was tracked until it impacted the Lunar surface on command at 7 degrees N latitude, 161 degrees E longitude (selenographic coordinates) on the Moon's far side on 29 October 1966 on its 577th orbit. The early end to the nominal one year mission was due to the small amount of remaining attitude control gas and other deteriorating conditions, and was executed to avoid transmission interference with Lunar Orbiter 2. The Lunar Orbiter program consisted of 5 Lunar Orbiters which returned photographs 99% of the surface of the Moon (both the near and far side) with resolution down to 1 meter. Altogether, the Orbiters returned 2180 high resolution and 882 medium resolution frames. The micrometeoroid experiments recorded 22 impacts showing the average micrometeoroid flux near the Moon was about two orders of magnitude greater than in interplanetary space but slightly less than the near Earth environment. The radiation experiments confirmed that the design of Apollo hardware would protect the astronauts from average and greater-than-average short term exposure to solar particle events. The use of Lunar Orbiters for tracking to evaluate the Manned Space Flight Network tracking stations and Apollo Orbit Determination Program was successful, with three Lunar Orbiters (2, 3, and 5) being tracked simultaneously from August to October 1967. The Lunar Orbiters were all eventually commanded to crash on the Moon before their attitude control gas ran out so they would not present navigational or communications hazards to later Apollo flights. The Lunar Orbiter program was managed by NASA Langley Research Center and involved building and launching 5 spacecraft to the Moon at a total cost of $163 million. That amount is coincidentally nearly the same as the initial budget ($160 million) for the Hyper-X (X-43) program later conducted jointly by the Langley and Dryden Research Centers, whose original plan was to fly 5 hypersonic aircraft in the Earth's atmosphere. Hyper-X ended up costing $230 million, and only 3 flights were made during its seven year development program. USSR Zond 7 reentered the Earth's atmosphere after having flown past the Moon on a picture-taking mission, and achieved a soft landing in a preset region south of Kustanai. Zond 7 was launched 7 August 1969 towards the Moon from a mother spacecraft (69-067B) on a mission of further studies of the Moon and circulmunar space, to obtain color photography of the Earth and the Moon from varying distances, and to flight test the spacecraft systems. It was the only completely successful L1 flight that could have returned cosmonauts alive or uninjured to Earth. Earth photos were obtained on 9 August 1969. On 11 August 1969, the spacecraft flew past the Moon at a distance of 1984.6 km and conducted two picture taking sessions. Zond 7 successfully accomplished a double-dip re-entry into the Earth's atmosphere on 14 August 1969, and achieved a soft landing 50 km from its aim point south of Kustani in the USSR. Asteroid #2994 Flynn was discovered by Perth Observatory at Bickley. N. Chernykh discovered asteroids #2294, #2477 Biryukov, #2497 Kulikovsk, #2579 Spartacus and #2670 Chuvashia. Z. Vavrova discovered asteroid #2474 Ruby. Z. Vavrova discovered asteroid #2390 Nezarka. USSR launched the Progress 23 resupply vehicle from Baikonur to the Salyut 7 space station. USSR launched Progress 23 on 14 August 1984 to transport various cargoes to the Salyut 7 orbital station. It docked with Salyut 7 on 16 Aug 1984 at 08:11:00 GMT, undocked on 26 Aug 1984 at 16:13:00 GMT, and was destroyed in reentry on 28 Aug 1984 at 01:28:00 GMT. Total free-flight time: 3.46 days. Total docked time: 10.33 days. E. Bowell discovered asteroid #3327 Campins. The Intelsat 6 F-5 communications satellite was launched from Kourou on an Ariane 44L booster, positioned in geosynchronous orbit at 24 deg W 1991-1997; 27 deg W 1997-1999. 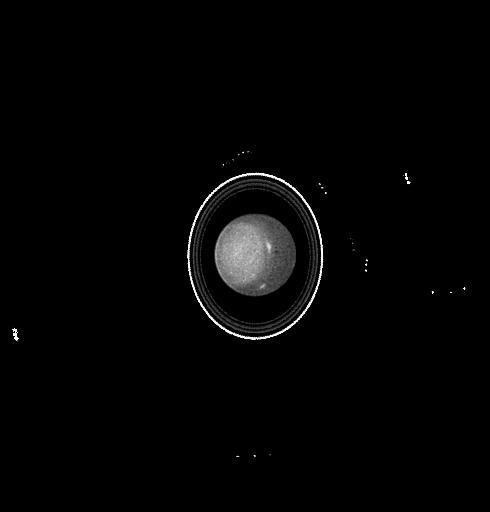 NASA's Hubble Space Telescope took pictures of the rings of Uranus. Russia launched the Molniya 1-89 communications satellite from Plesetsk into a 968 x 39,391 km (601 x 24,476 mi) orbit inclined 64.10 degrees to the Equator. Soyuz TM-25 landed in Kazakstan, 170 km SE of Dzezkazgan. The Soyuz landing rockets failed to fire on touchdown, giving one of the roughest landings experienced by a returning Mir crew. NASA's Galileo probe made the Callisto 22 flyby. A blackout covering eight US states from Michigan to Massachusetts and part of southeastern Canada left 50 million people without power, the worst infrastructure collapse in US history. Alternative energy sources are required to prevent future problems. Comet Swift-Tuttle (5 km diameter) will reach perihelion, approaching close to Earth. Current predictions estimate it will pass at a distance of about 15 million miles.